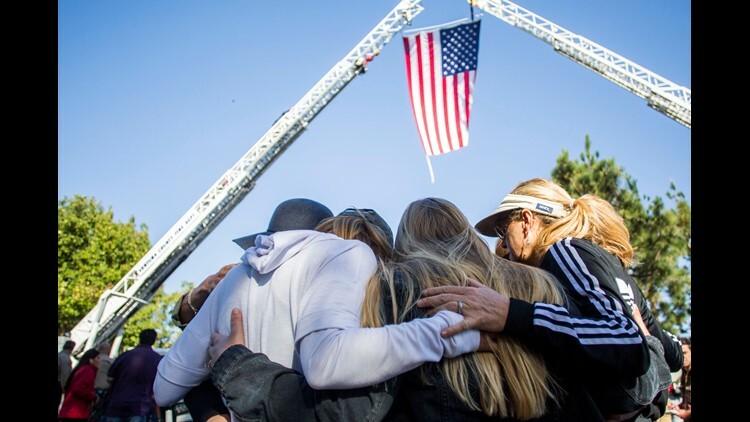 Friends hug outside Los Robles Medical Center in Thousands Oaks, California, paying tribute to Ventura Country Sheriff's Sgt Ron Helus, killed in the shooting at the Borderline Bar in Thousands Oaks on November 08, 2018. - The gunman who killed 12 people in a crowded California country music bar. 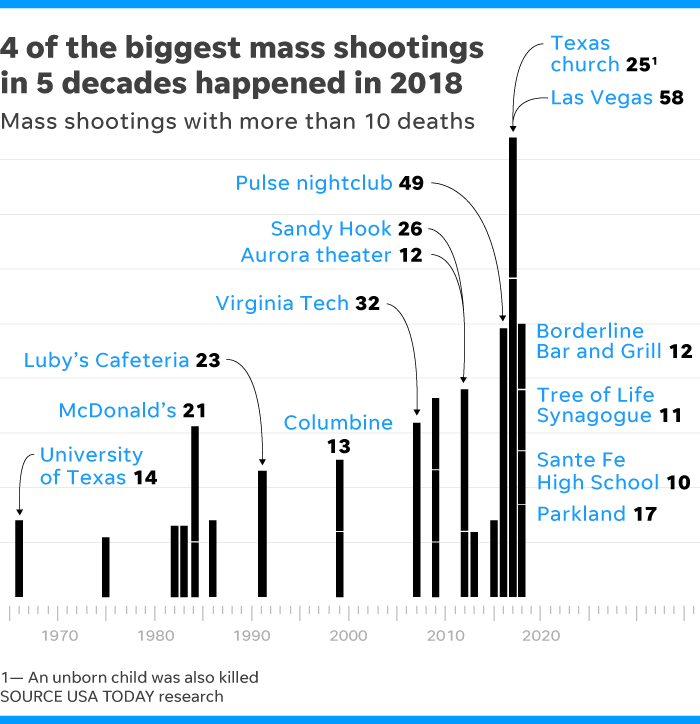 311 days, 307 mass shootings in the U.S.
What we know about the Thousand Oaks shooting. There's a fast-moving wildfire near Sacramento, California. Justice Ruth Bader Ginsburg is in the hospital. DACA stays in place. Missed the headlines today? We’ll catch you up. When the thunder of gunfire broke through a country music dance hall packed with young people kicking back on "college night," Thousand Oaks, California, added its name to a dark roster: the site of the 307th mass shooting. It took place on the 311th day of the year. Cody Coffman, 22, was the oldest of three, and was excited to be a big brother to his first sister, expected later this month. He planned to enlist in the Army. Alaina Housley, 18, a freshman at Pepperdine University, had gone to the Borderline to line dance with friends. She is the niece of “The Real" host Tamera Mowry-Housley. Justin Meek, 23, never stayed idle. Meek was working as a bartender at Borderline when the shooting started. He graduated from California Lutheran University where he studied criminal justice. A federal appeals court ruled Thursday that Trump cannot end the Obama-era program that protects undocumented immigrants brought to the United States as children. The decision leaves in place the Deferred Action for Childhood Arrivals program known as DACA, which has protected more than 700,000 undocumented immigrants from deportation and enabled them to get work permits. The Justice Department is likely to appeal the ruling to the Supreme Court. Ruth Bader Ginsburg, the Supreme Court's eldest justice, fractured three ribs when she fell at her office Wednesday night. In recent years, Ginsburg has gained celebrity status among progressives – who lovingly refer to her as the "Notorious RBG." Though she's known for hitting the gym, some Democrats have expressed concerns about the 85-year-old's health. President Donald Trump has appointed two Supreme Court justices since taking office (Justice Brett Kavanaugh's investiture ceremony was today), and another opening on the bench could ensure conservative control of the court for decades. Take a deep breath. Today's news won't quit. Here's more. • The White House promoted a doctored video on Wednesday to justify revoking Jim Acosta's press badge following the CNN reporter's questioning of President Donald Trump earlier that day. Watch for yourself. • Developing: A fast-growing wildfire forced tens of thousands of residents from their homes in northern California on Thursday. The “Camp” Fire has scorched over 12 square miles in Butte County, about 90 miles north of Sacramento. The fire is burning about 80 acres per minute, equal to about 60 football fields per minute. Find updates here. • In a farewell letter, ousted Attorney General Jeff Sessions on Thursday characterized his often-tumultuous tenure an "incredible honor" and urged colleagues to "protect the American people and the rights we hold dear." Sessions never referred to President Donald Trump, who abruptly dismissed the former Alabama senator Wednesday following months of unrelenting criticism. • A group of angry Antifa protestors chanted outside of Fox News anchor Tucker Carlson's home on Wednesday evening and broke a door. The anti-fascists group chanted "Tucker Carlson, we will fight. We know where you sleep at night," His wife, Susie, was alone at the time and locked herself into a pantry and called police. This is a compilation of stories from across the USA TODAY Network. It's been an intense news week. It's Emily and Ashley, and we're signing off now to go watch this baby laugh at water.